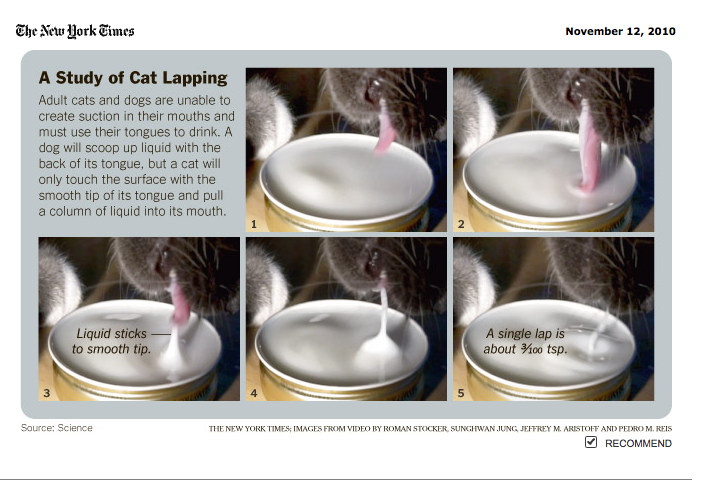 The Science section of The New York Times has published a story about how cats lap water. The Times online has also embedded a four minute forty-five second video illustrating “the biomechanics of feline water uptake.” Translation: see for yourself in slow motion how Cutta Cutta, an M.I.T. engineer’s pet cat, drinks. While this engineer was having breakfast, he was observing Cutta Cutta lap. Instead of investing his vast intellect in the direction of global warming, our dependence on fossil fuels, or the rapidity of college student alcohol intake, he focused his attention on his cat delicately darting its tongue into its water bowl at lightening speed. This seemingly ordinary act of feline nature fired this engineer’s imagination, as well as that of an M.I.T. colleague, and two other engineers, one from Princeton, and the other from the Virginia Polytechnic Institute. I have deduced that these four brilliant men of science had an immense amount of time on their hands, and were also under pressure to look busy. I have experienced a similar situation in my own place of employ, where I oversee the labeling of floor tile. When there is a lull in my workload, I exploit this opportunity to clean my desk, an act I have performed precisely once in six years much to the astonishment of my boss and colleagues who initially assumed that I was preparing to give notice. Returning to the topic of the study of cat lapping I suspect this research would have gone in an entirely different direction had that engineer been focused on Cutta Cutta making use of the litter box. Although I am personally a dog person by default, being deathly allergic to cats, I do have a soft spot for Maru, the superstar box jumping cat from Japan. While watching the video below, I noticed that I sneezed. After detailing precisely how a cat laps, the rate of lapping, and the amount of liquid consumed, the Times notes, “To the scientific mind, the next obvious question is whether bigger cats should lap at different speeds.” To my unscientific mind, the more obvious follow-up question is, “Who the hell cares?” Why four engineers from some of the brainiest think tanks out there would be prompted to study a cat tonguing a dish of milk baffles me, unless this is just to prove that they’re worthy of collecting a paycheck. How does knowing how a cat laps, whether it’s my boss’s two calicos, or Leo the MGM lion, or Cutta Cutta, make this world a better place? Considering that some of our greatest minds are investing their time studying the mechanics of how cats drink assures me that the world is definitely going to the dogs. 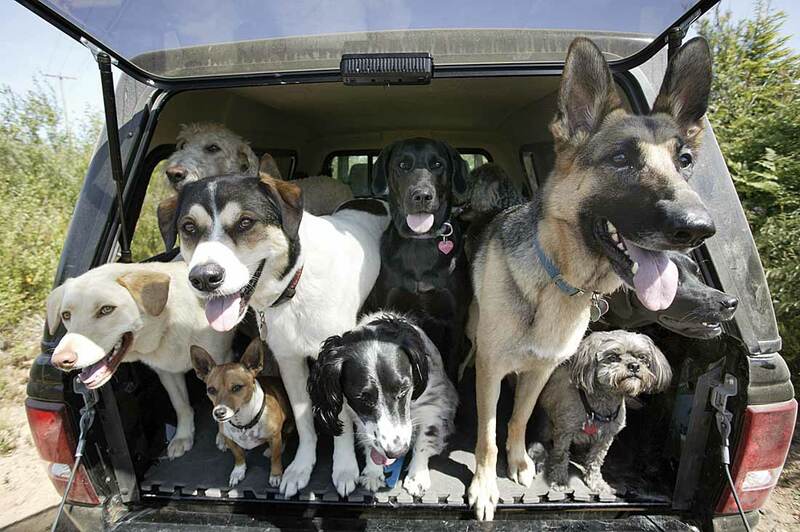 This entry was posted in Humor and tagged cats, dogs, science, the new york times. Bookmark the permalink. I now know more about my 6 cats….thanks.